On Monday morning the park is still locked when we get there. The boys and I walk aimlessly up and down the street for fifteen minutes but no one turns up to unlock it. It’s Half Term, the world goes mad. L sends me shopping for mincemeat and I am laughed out of Sainsbury’s because it’s February. So, you can buy hot crossed buns all year round but apparently you can only buy mincemeat in December. L and Daughter go to running club for a spot of intimidation. L has seen that they’ve been putting stuff on Facebook about running nine minute miles tonight and thinks they will try to lose them. I tell her not to be so pessimistic but she turns out to be right, they get dumped. I’m not sure they’ll be going back again. Thankfully on Tuesday the park in open as usual. So, the boys are relieved. I get to cycle to work in the quiet half term traffic while L looks after the carpet fitters who are doing our back room. In the evening it’s dogging and L also heads over to Derby to see her folks but on the bus. Naturally the three of us don’t think she’s avoiding us. On Wednesday, my colleague and I take advantage of the usual ‘Wednesday Wow’ at the Yard (2 for 1 pizzas) but find out they have revamped the menu. There’s now a lot more choice but there are also way too many random vegetables chucked into the mix for no good reason. Do artichokes, aubergine, avocado, spinach etc really go well on a pizza? Derby have a game on Wednesday evening but lose a dire match 1-0 to Millwall. Meanwhile L and Daughter attempt a dog run but abort it when the Lad legs Daughter down. It’s not been a very good running week for them. Thursday is my long run day and I run home from work again. I have been looking at getting a new Garmin but I’ve not made a decision yet. By the time I’ve decided what I want my marathon will be done and dusted. 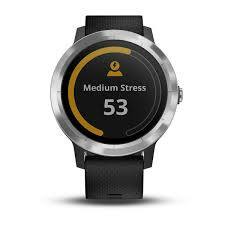 I do see they now do a watch that tells you how stressed you are... very useful for the female in your life. After our various activities, L is again at tennis, we crack open a few cans of Guinness Mid-Strength. At 2.8% ABV the 660ml cans work out at 1.8 alcohol units each. So hardly alcohol free but actually rather pleasant. Perhaps a slight upgrade on the Mackeson, which is also 2.8%.